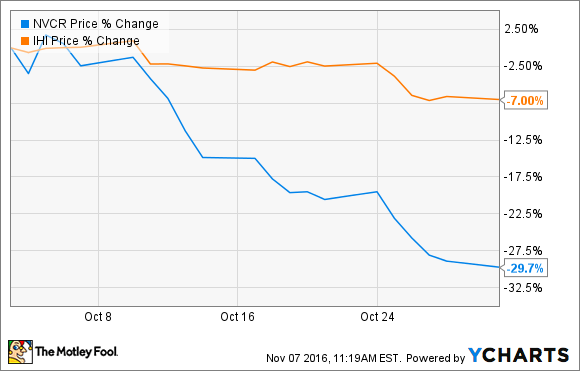 NovoCure Ltd. Fell 29.7% in October -- but Why? Shares of the commercial-stage medical-device company fell hard despite good news. Shares of NovoCure (NASDAQ:NVCR), a cancer-focused medical-device company, plunged more than 29% in October, according to data from S&P Global Market Intelligence. That was far worse than the 7% hit the iShares U.S. Medical Devices ETF took. Given that huge drop, you would expect that the company had some awful news to report, but that simply wasn't the case. The only press release to come out of the company in October was an announcement that the first patient had been enrolled in its METIS trial, which is studying the company's Optune system as a hopeful treatment for brain metastases caused by non-small cell lung cancer. This study will enroll up to 270 patients and will compare how the disease progresses in patients using the Optune system after radiosurgery versus receiving supportive care alone. The primary endpoint of the study is time to first cerebral progression; secondary endpoints include time to neurocognitive failure, overall survival, and radiological response rate. The METIS study represents NovoCure's first phase 3 pivotal trial outside of glioblastoma, and if all goes well, it could open up another avenue for growth. Therefore I'm left scratching my head as to why shares plunged during the month. NovoCure has been a tough stock to own since it went public, but a closer look at its results suggests that there are reasons to remain optimistic. For one, we recently learned that UnitedHealth Group (NYSE: UNH) will begin to cover the Optune system starting on Jan. 1. That's huge news, as United was the last major insurance company that had yet to sign on. NovoCure believes that more than 177 million Americans will have access to the Optune system at the beginning of the year -- an impressive bump from the 130 million Americans who had coverage as of the end of September. Next, the company's third-quarter results showed that demand for the Optune system continues to be strong. NovoCure ended the quarter with 985 active patients on the system, which is up 110% over the year-ago period. That allowed the company's revenue to grow by 142% to $21.7 million. Given the expanded insurance coverage, the odds are good that the company's top line will continue to soar. Finally, the clinical evidence supporting use of the Optune system continues to grow. NovoCure announced in September that long-term data supported the use of the Optune system in conjunction with temozolomide in patients with newly diagnosed glioblastoma. The data showed that the patients who used the system showed gains in both progression-free survival and overall survival. A more detailed look at the data will be presented at the Society for Neuro-Oncology's Annual Meeting later this month. Overall, NovoCure continues to execute against its long-term plans to expand coverage and drive adoption. If the company can continue to grow its top line at triple-digit rates, long-term shareholders should be rewarded for their patience.